Teenage rebellion at its tamest. I’ve already declared my allegiances for Qiao Ran, but I definitely felt myself sorta, kinda leaning towards Chen Xun in this episode. Don’t get me wrong; I still love Qiao Ran and hope that Fang Hui ends up with him, but I can’t deny that Chen Xun really loves her. There’s finally some drama and obstacles in the OTP’s relationship (besides ya know, Fang Hui’s murderous relationship history), and they’re proving that they’re the real thing, despite it all. Fang Hui looks at the newly posted class rankings and sees that she’s ranked in the 200s, whereas Chen Xun is the top 50. He tells her that it’s no biggie since it’s just one test, and that there’s plenty of time for her to improve her grades. They must have been standing there for awhile because they’re both super late to class. Too bad for them that they’ve got the strictest teacher ever and she lectures them in front of the entire class for being irresponsible. The teacher’s apparently on a roll with her lecturing because she goes on and on about how this year is one of the most important in their lives. She tells them that all their focus should be on studying and getting into a good college. Their teacher makes the class write down on a large poster where they each want to attend college. Apparently Jia Mo wants to go to a performing arts school…to become famous so Su Kai can see her every day on TV. Okay, scratch what I said in the last recap about her being over him. Fang Hui wants to go the same school as Chen Xun but is worried that her grades aren’t good enough. She later writes on the class poster that she also wants to attend Tsinghua University, one of the premier universities in China, which was what Chen Xun wrote. Time to hit the books! The teacher from hell begins the day’s class with a story about how she intercepted a love note that a guy was passing to a girl in the other class. She repeats her previous threat that if any of them does anything like that, they’ll be kicked out of the class. Fang Hui is silently freaking out in her seat because Chen Xun had literally just passed her a note. Chill out, everyone, chill. Fang Hui and Chen Xun are hanging out after school, and she asks him if he thinks that their teacher was hinting earlier that she already knows about their relationship. Chen Xun says that she’s overthinking things and should use some of that energy to focus on the next exam. He kisses her on the forehead, and OF COURSE their teacher just so happens to bike right by them. Chen Xun doesn’t think it was her, but we all know better. When Fang Hui gets home, her mom is already waiting in the living room for her. That’s gotta be one of the scariest sights ever, right? When your parents are sitting there with a scowl on their faces, and you know that you’re about to get yelled at big time. Oh, those teenage days. Her mom asks why she’s coming home so late, and Fang Hui lies that she went to ask the teacher about homework. Her mom immediately calls her out on it though because their teacher had just called her to tattle. Her mom says that from now on, she’s not allowed to talk on the phone, come home late, or hang out with boys. The next day, Fang Hui isn’t even allowed to ride the bike to school and is dropped off by her mom instead. 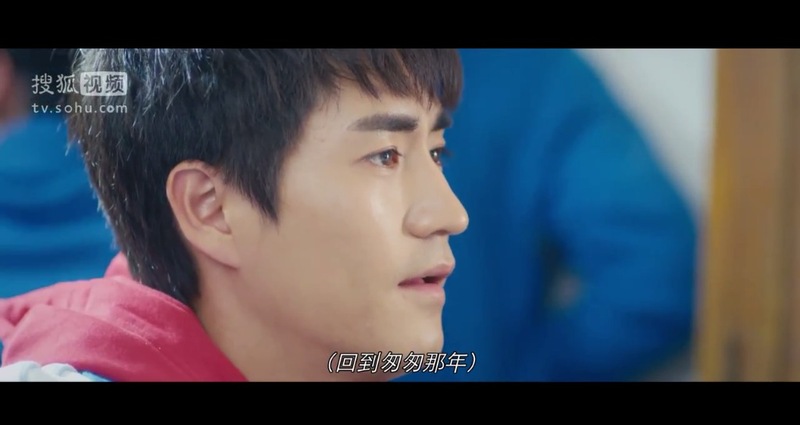 Chen Xun is pissed that Fang Hui is pretty much forbidden to see him anymore, but the rest of the Fab Five tells him that he needs to calm down and think rationally. Jia Mo advises Fang Hui to study harder and use her good grades to shut up their teacher. Fang Hui comes home to see that her mom has gone through her stuff. When she asks her mom about it, she throws down a stack of love letters that Chen Xun had written her and tells Fang Hui to rip them up herself. If she doesn’t do it, then she needs to immediately transfer schools. Poor Fang Hui has no choice but to rip up every single one of the letters. So sad. Fang Hui spends the next few days diligently studying away. When she does sneak off to call Chen Xun, she finds out that her mom cut the telephone cord. Her mom clearly was not messing around. While she’s studying one night, she sees Chen Xun standing outside, beckoning her to come outside. Obviously Fang Hui takes this opportunity to sneak out of the house without a second thought. The two run off to some type of underground band performance, but it’s super PG. No ratchetness around here. Fang Hui can’t seem to relax though because she keeps talking about how her exam scores still aren’t as good as his, and she’s scared that they can’t get into the same school. Chen Xun tells her if that’s the case, he won’t apply for Tsinghua and will instead go for a school that they can both get into. Tell me; is that romantic or insulting? I’ll go with romantic…I think. Chen Xun reassures her that they’ll definitely get into the same school, and that they’ll be together always. Note that he does not say what school. Then, he pulls the oldest trick in the book drama and puts a soda tab on her finger and “proposes.” Super cheesy, but she loves it and accepts. I’ll admit that it was cute stuff. Chen Xun and Fang Hui happily skip and run back to her place, literally. But they’re in for quite the unpleasant surprise when they see Fang Hui’s mom waiting outside for them. Both of their moms argue with each other at school the next day, blaming the other’s kid for “corrupting” their own. Chen Xun and Fang Hui are outside in the hallway and can hear everything. He reassures her that no matter what anyone says, he’s going to continue liking her. And when they get into the same college, no one will have anything to say. Their teacher makes Fang Hui move her seat to the front of the class, and it’s basically right next to her own desk. Ugh, that’s the worst. Chen Xun volunteers to switch seats instead, but nope, not happening. After school, the teacher makes Fang Hui stay to talk about how terrible her scores are. She hits where it hurts the most by saying that Chen Xun is Tsinghua-bound, and she’s nowhere near his level. She orders Fang Hui to bring home her report card to show her mom. That’s going to be a fun talk. Not. No one likes the front row. During afternoon announcements, Chen Xun comes on the PA system to dedicate a song to the students who are willing to love, and that it’s especially dedicated to his love, Fang Hui. He plays the guitar while serenading the school over the PA system, with Qiao Ran and Zhao Ye’s help. This one’s for you, girl. 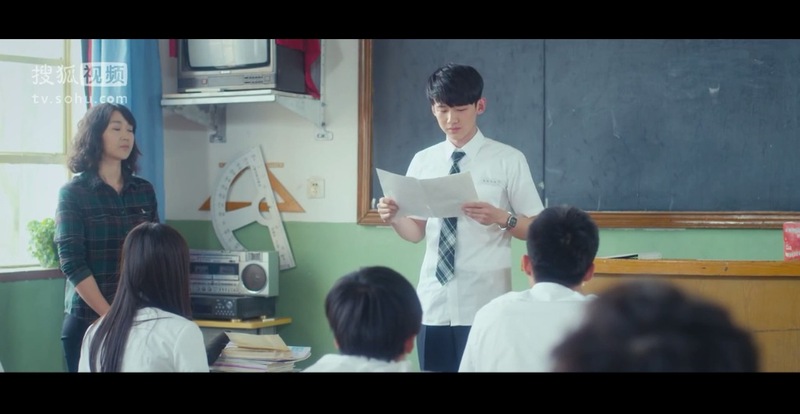 The teachers all rush over to kick him off the air, but Zhao Ye bravely holds them back. All the students listening to the song hear the commotion in the background and they cheer on Zhao Ye. Fang Hui’s crying while Jia Mo is comforting her. By the time that Chen Xun finishes his song, the teachers finally get past Zhao Ye and Qiao Ran. But yay for the Three Amigos for this act of romantic rebellion! Over the next few months, everyone’s hard at work studying for the upcoming college entrance exams. It’s giving me major flashbacks to my own days of SAT notecards and practice exams. How high school. During this time, Fang Hui’s academic performance really improves, and she’s now ranked in the top 50 with Chen Xun. You go, girl. During class, their writing teacher (a much nicer lady) asks Qiao Rang to read his latest essay to the entire class. He’s reluctant to do it, but the entire class forces him to read it. Turns out that his reluctance is due to the fact that the essay is about Fang Hui and his feelings for her. He wrote about the time that they went and picked out “happiness flowers” together, and how he remembers that moment whenever the flowers bloom during springtime. Tears! Fang Hui immediately realizes that he’s talking about her, but doesn’t say anything about it later. Most poetic love confession ever. The Fab Five are hanging out during break and talking about what they plan to do right after they finish their exams. After some kidding around, Jia Mo tells them that the wisest decision she’s made in her life was transferring to this school and meeting them. To express their everlasting friendship, they decide to carve their names into one of the trees at school. Ah, so that’s the tree that present-day Chen Xun goes to in episode 1. On the day of the exam, Fang Hui ain’t looking so good. During a break, she tells Chen Xun she’ll be fine when he gets concerned about her. 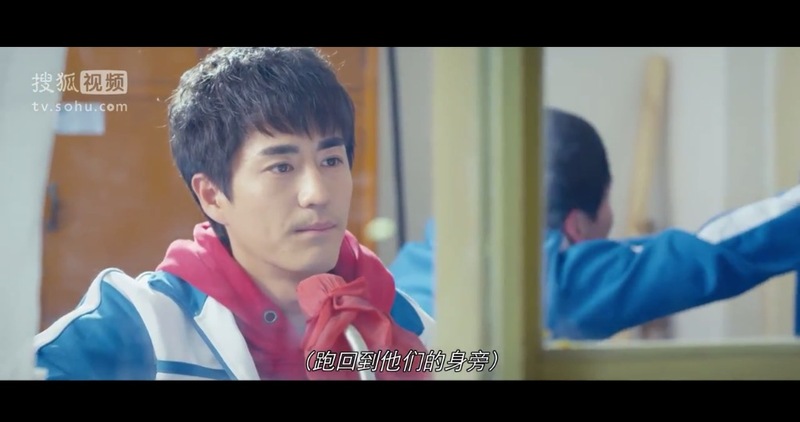 As the test goes on, Chen Xun starts to think about how he kept saying that he wants Fang Hui and him to go to the same school, but then also how her scores might not be good enough to match his. Once he remembers all these promises he made to her, like how he won’t let her be alone, he puts down his pencil. But wait, he didn’t finish the exam yet! With his incomplete exam in hand, Chen Xun gets up from his desk. Please tell me that he’s not throwing away his entire education and future for Fang Hui. Don’t do it, Chen Xun. Jia Mo fails in her audition to get into the performing arts school. Luckily she still has Zhao Ye to comfort and reassure her that in his eyes, she’s still the best. Aw. Chen Xun says that he wants to go on vacation with Fang Hui after their exams, and poor Qiao Ran is sitting right next to them while they’re showing off their lovey doveyness. Hey, that’s the drama name!